Also known as a Carriage Maker’s or Jack Rabbet Plane, this is the largest rabbet plane made. Based on the Stanley 10¼, which went out of production in the mid-1940s, we modified the design to fit the Bedrock format. Adjustable side nickers make clean, cross-grain cuts. Both handle and knob can tilt left or right to give better access and control in tight corners. Blade is 2-1/8" wide x .130" thick. Iron body only, 5 lbs. 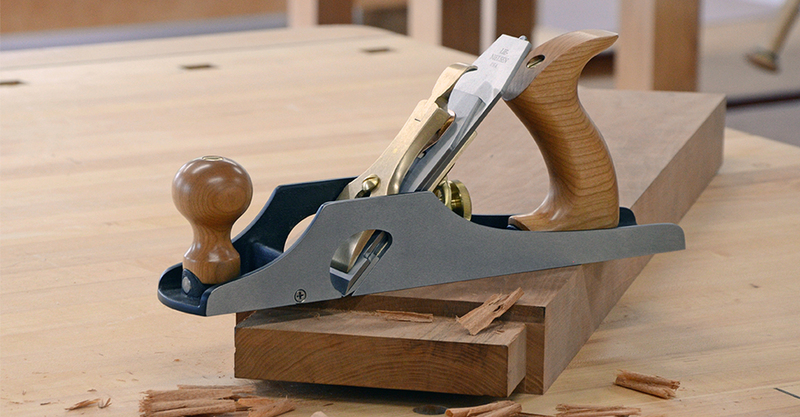 A Bench Rabbet Plane is very handy for working large rabbets and tenons, while also doubling as a Jack Plane. 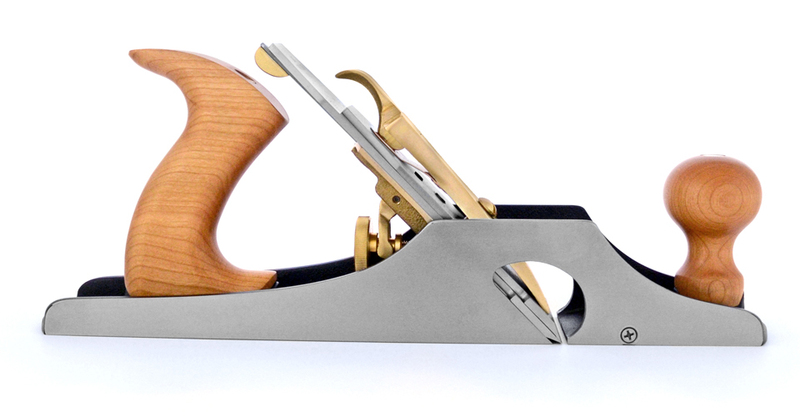 The Lie-Nielsen Bench Rabbet Plane is based on the Stanley Bedrock-type planes. Bedrocks were Stanley’s top line of Bench Planes, heavier and better made than the standard. 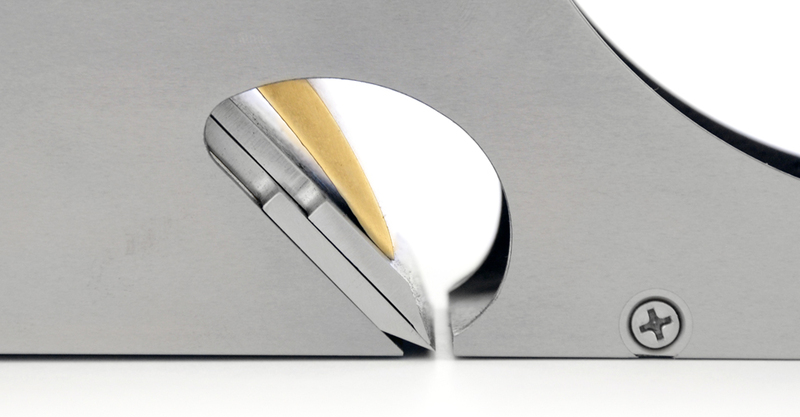 In addition, the construction of the frog is unique — it features a fully machined fit between frog and body, adjustable from the rear without having to remove the blade and cap. This allows you to easily change the mouth setting from a coarse to a fine cut for difficult woods or fine smoothing passes. For heavy cuts, adjust the frog back so the blade rests directly on the plane body. Removing and re-installing the blade can be tricky. The easiest method is to remove the cap screw first. To advance the blade, turn the adjuster screw clockwise. It is always a good idea to finish adjusting the blade with a forward adjustment to take up backlash and prevent the blade from moving. In order to be able to adjust the blade easily, do not overtighten the lever cap screw. The blade is about .005" wider than the body. Align the edge of the blade with the side of the body that you want it flush with (laying the tool on its side helps to do this quickly and accurately) or grind a little off the side of the blade to make it flush with both sides if you want. The circular nicker, made of A2 Steel, protrudes by .010" and can be rotated to expose the edge as needed. Retract by rotating so the flat is at the bottom. Occasionally you may need to hone the flat on a fine waterstone to sharpen. Loosen the nut on top of the knob and handle to tilt to one side or the other. Tighten, but do not overtighten, nuts. Lubricate the pivot bar occasionally. The body is cast from Ductile Iron, a very strong alloy that will take a lot of abuse. These castings are fully stress relieved, a process that removes inherent stresses and ensures that the tool will remain flat and true.